From the satisfying whooshes and thuds of the Leviathan Axe, to the ambient sounds surrounding us as we journey alongside Kratos and Atreus, a huge part of what makes God of War so epic to experience is the incredible sounds we hear as we interact with world the game presents to us. And PlayStation has just dropped a behind the scenes look at how some of the most iconic sounds were created with lead sound designer Mike Niederquell and creative director Cory Balrog. One of the most memorable moments in God of War is undoubtedly when the colossal World Serpent emerges from the water in front of Kratos and Atreus. Its deep, world-shaking voice really was unlike anything I’d ever heard before, and - as the video reveals - that’s exactly what the team was going for. Taking this inspiration on board, Mike did some research on YouTube and began mimicking the throat singing into a microphone. Using different pitch plugins similar to auto-tune, he was then able to create the deep, bellowing voice we hear in the game. Alongside the throat singing, the video also reveals that sounds from kitten purrs, buffalo, tigers, and Beluga whales were layered together to give the World Serpent its unique creature-like sound. The Leviathan Axe is one of the most satisfying weapons to play around with, and that’s in no small part thanks to the various sounds it makes as you wield it. From cleaving to thudding, and whooshing through the air and returning the Kratos’ hand, the video details just how they accomplished all of the sounds of its various movements and functions. 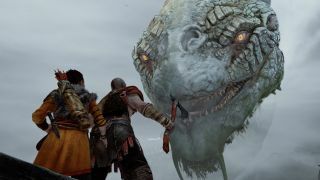 Cory also talks about the “sounds of fatherhood”, which takes a look at the changing relationship between Kratos and Atreus, and how that's reflected in their words. From footsteps to foes, and much more besides, it’s amazing to see the process behind all of God of War’s sound magic. Just getting stuck into the adventure with Kratos? Be sure to check our God of War tips to help you on your way.